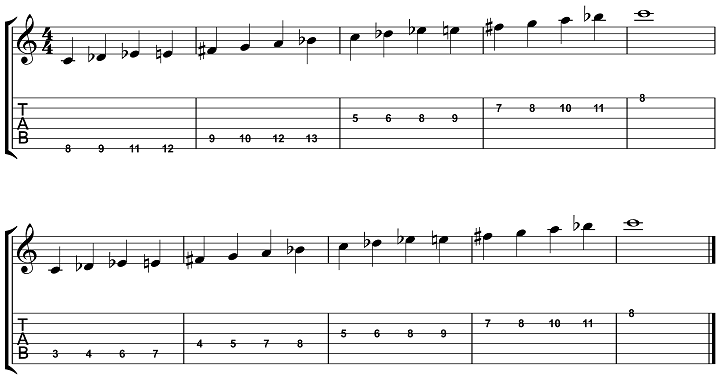 In this lesson, our third look at Symmetrical Scales, we will be exploring one of the most commonly used non-modal scales, the Half-Whole Diminished Scale. This scale is named quite literal, as it is built by alternating half-steps and whole-steps, one after the other, producing eight unique tones that form the scale as a whole. Notice that there is two 3rds in the scale, the b3 and 3, Eb and E in the key of C. You can also think of the b3 as a #9 interval, as it is usually seen at the top of the chord rather than at the bottom. For example, you might see this scale used over a C7(b9,#9) chord, where the Eb is being seen as a #9 rather than a b3. It’s not a huge deal, but worth looking at so it’s not confusing. Feel free to use b3 or #9 when you are writing this scale out, whatever is easiest for you. Here is how a Half-Whole Diminished Scale looks like on paper in both Tab and Notation from the root-note C.
To help you get started in your exploration of this scale, here are two common fingerings for a C Half-Whole Diminished Scale, one with a 6th-string root and one with a 5th-string root note. After you have learned these two shapes, try expanding them to all 12 keys across the fretboard, and begin to apply them to your soloing ideas either over a 7b9 chord, as that is the chord that fits with the Half-Whole Diminished Scale. Write out all 12 keys of the Half-Whole Diminished Scale in the comments section below, using the "spoiler" tab on the left side of this screen, and I will be happy to go over your work to see how you are doing with writing out this fun and important scale. Do you have any questions about the Half-Whole Diminished Scale? Post any questions or comments below and I will be happy to answer them for you.